Playing an acoustic is easy – the sound you hear is the sound you get; okay you might get a bit more bass/middle/treble tone out of different guitars and you might add a bit of reverb and chorus, but an acoustic guitar sounds like an acoustic guitar. But pick up an electric, plug it in and the possibilities are endless! However finding the right tone can take years, although you can have great fun plugging in a few pedals and listening to what sound you get. 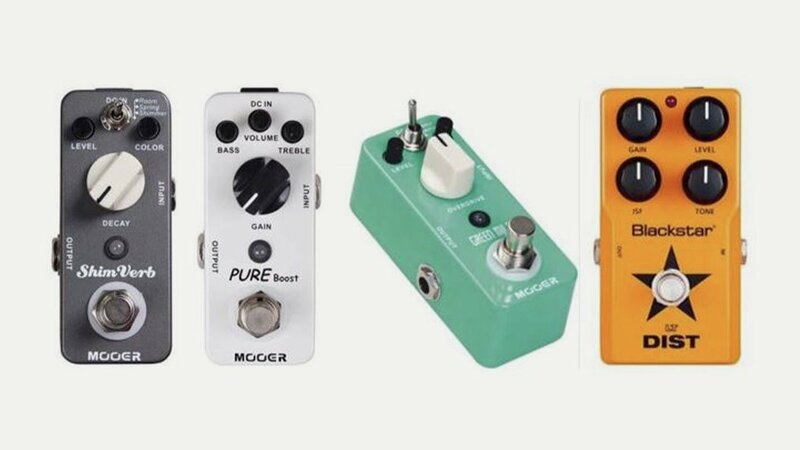 However, pedals are in, which means there are thousands on the market, many of which have ‘interesting’ names that bear no relation to what they do. They also vary in cost (from about £30 to £hundreds) and size (from micro pedals to two and three footswitch models). But what does each pedal do? A delay based effect designed to simulate what happens when two instruments play the same part – makes your six-string sound like a twelve string! Using a compressor boosts quiet notes and reduces heavy signals such as chords, averaging out the natural differences. This makes finger picked passages sound smoother and gives more flow to clean lead passages. Echo-units copy the natural effect of a sound being deflected from a distant surface using analogue or digital means. This makes your guitar sound fuller and alive, rather than flat and monotone. A delay-based effect that originated with tape recorders (listen to some of the 70’s rock records to hear it) where the sound produced is mixed with the normal sound. Mixes slightly out of phase identical signals giving colouration to the sound. The volume of the signal is modulated producing a rhythmic pulsing effect. Don’t get confused with the tremolo arm on your guitar – technically that is a vibrato! Here the pitch of the signal is modulated rather than the volume of the signal. A foot operated pedal – when the pedal is flat a high treble sound will be produced and when you raise the pedal gradually the bass is increased. Used in funk and blues a lot. Other pedals include Booster, Octave, Pitch and many more. You can of course plug many pedals in at once to shape and form your own sound. A word of caution though – the great BB King spent all his life trying to produce the sound he ‘could hear in his head’ which wasn’t the sound we could hear!